There's something running "a-fowl" in space! A stunning new image reveals the bustling Lambda Centauri nebula, which is sometimes nicknamed the "Running Chicken" nebula, because of the birdlike shape that some people detect in its brightest region. The nebula, which is also known as IC 2944, is made up of glowing hydrogen and newborn stars. The stellar nursery is located in the constellation of Centaurus (The Centaur), approximately 6,500 light-years from Earth. The image was taken by the European Southern Observatory's MPG/ESO 2.2-meter telescope at the La Silla Observatory in Chile. Hot newborn stars that formed from wispy clouds of hydrogen gas shine brightly within the nebula. The intense ultraviolet radiation from the young stars makes the surrounding cloud of hydrogen glow a dramatic red, astronomers said. 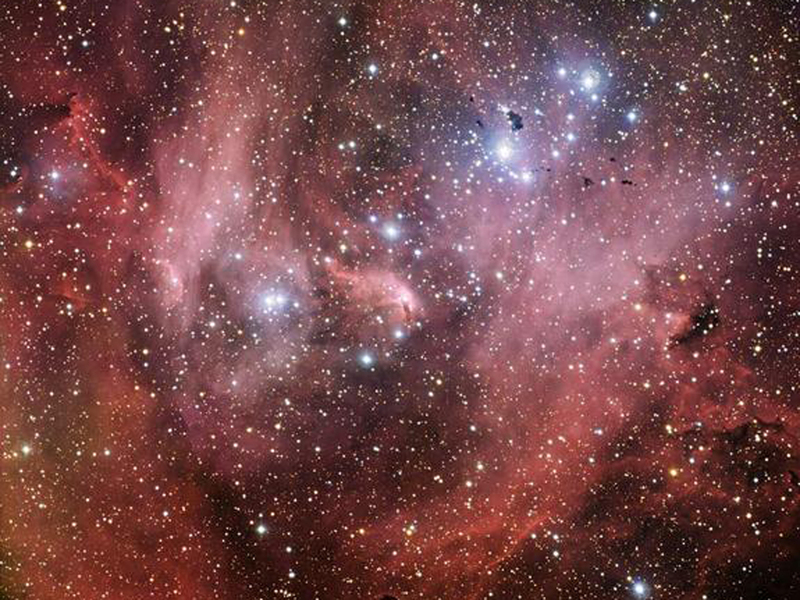 Similar to shapes in clouds, some people see a chicken in pictures of this bright, red star-forming region, which led to the nebula's unusual nickname. According to astronomers at the European Southern Observatory (ESO), there is some disagreement over which part of the nebula is shaped like a chicken, since different birdlike features can sometimes be seen elsewhere. Another indication that the Lambda Centauri nebula is bustling with star formation is the series of black clumps dotted against the red background. These are examples of a type of cosmic object called a Bok globule, ESO astronomers said. Bok globules appear as dark features because they absorb the light from their more luminous background. But infrared telescopes that have the ability to penetrate through these dark clouds have shown stars are forming within many of them. In this image, the most prominent batch of Bok globules is known as Thackeray's Globules, which are visible by a group of bright stars in the upper right of the frame. These globules are named after the South African astronomer who discovered them in the 1950s, according to ESO. The stars embedded in Thackeray's Globules may still be evolving, which would make the stars in the cluster IC 2948, which is embedded within the Lambda Centauri nebula, their older siblings. These stars are only a few million years old, which, cosmically, is relatively young. The stars shine brightly and their intense ultraviolet radiation provides much of the energy that gives the nebula its striking glow. Yet, these glowing nebulas live relatively short lives, typically lasting a few million years, astronomers said. This means that the Lambda Centauri nebula will eventually fade away as it runs low on its supply of gas and ultraviolet radiation.